We are pleased to present "Lake Michigan Shoreline" screensaver. We hope you will enjoy the variety of beautiful photographs taken this year on the shoreline at P.J. Hoffmaster State Park. This park is a year-round tourist attraction on the eastern shores of Lake Michigan. The main feature of the 1,130 acre park is the forest-covered sand dunes that border over two miles of the Lake Michigan shoreline. 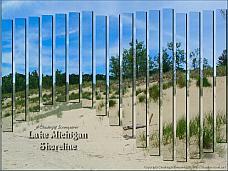 If you would like to learn more about the Lake Michigan Parks, click here. Musical compositions included with this screensaver are by Jalal; please take a moment to visit Jalal's online studio! Click Here. Please click here to download your free copy of "Lake Michigan Shoreline" screen saver featuring photography by the Cloudeight staff. We hope you enjoy watching it over and over!